With mozzarella, parmesan, breadcrumbs, and venison, this Italian classic is the perfect meal to share with friends and family. 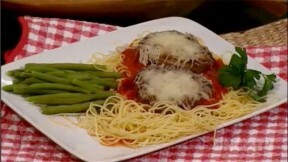 Watch Donna Reynolds make venison parmesan in this video clip from Carolina Outdoor Journal. Pound steaks to 1/4-inch thickness; cut into serving-sized pieces. In a shallow bowl, beat together egg and milk. In a separate bowl, combine House-Autry Pork Breader and parmesan cheese. Dip venison in egg mixture, then coat with breading mixture. In a large skillet, brown meat in oil on both sides. Place in a greased 13 x 9-inch baking dish. Combine pasta sauce and water; pour over venison. Cover and bake for 50 minutes or until meat is tender. Uncover; sprinkle with cheese. Bake 10-15 minutes, or until cheese is melted.